So it’s looking like winter might finally be on its way. This is your last ditch chance to make sure you have what you need inside before its time to close up shop. If you have some cold hardy herbs outside you can just leave them be, or you can divide them, take cuttings and pot them up. These sorts of herbs like to have a period of cold temperatures (min. 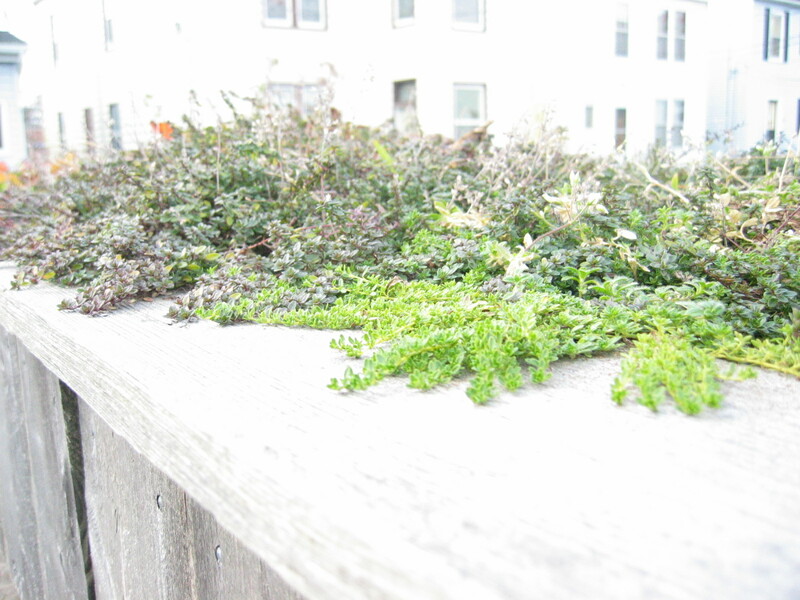 one month of near freezing temperatures), this is their dormancy period and they need it to survive. So now that they have had that, we can bring them in to snack on all winter long. 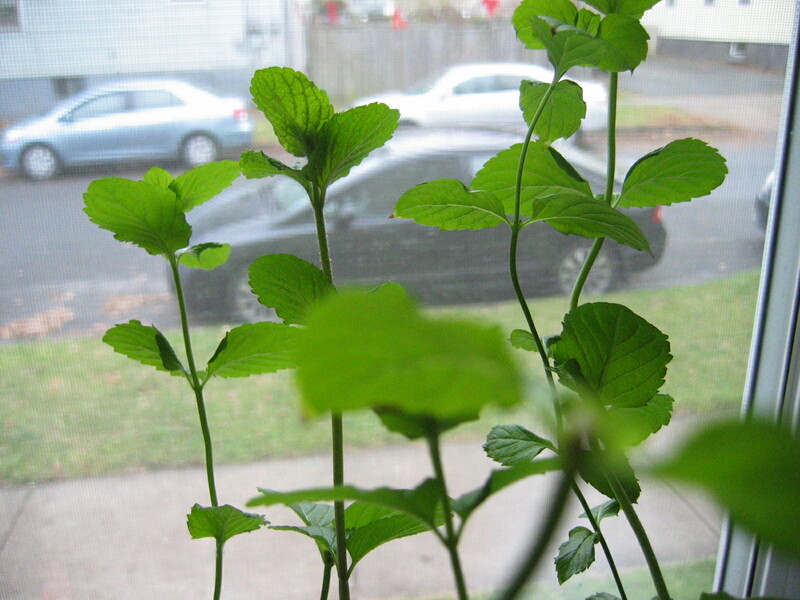 Mint: You can dig this up and pot it if you have too much, or simply pot up some stolons, place an inch of soil over them and watch them grow. North Carolina University has a great chart outlining the winter hardiness of most herbs, and some further tips on how to overwinter these plants outside if you prefer. You may also want to bring in almost anything in a pot. Pots are a such a small amount of soil, and are so much more exposed than in ground gardens and so they will freeze and thaw much more than your plants in the ground and so your plants may not survive they way they would in the ground. If you don’t want to bring these pots inside you can also bury and mulch your them outside if you have the space and they should do fine. You will want to cut your chives back quite a bit. When you’ve picked out the plants you’d like to bring inside you are ready to divide them and pot them up. First dig up the entire clump of the perennial cold hardy herb. Then with a sharp spade or knife, divide the amount you’d like to bring inside from the rest. Try to do this gently if you can. 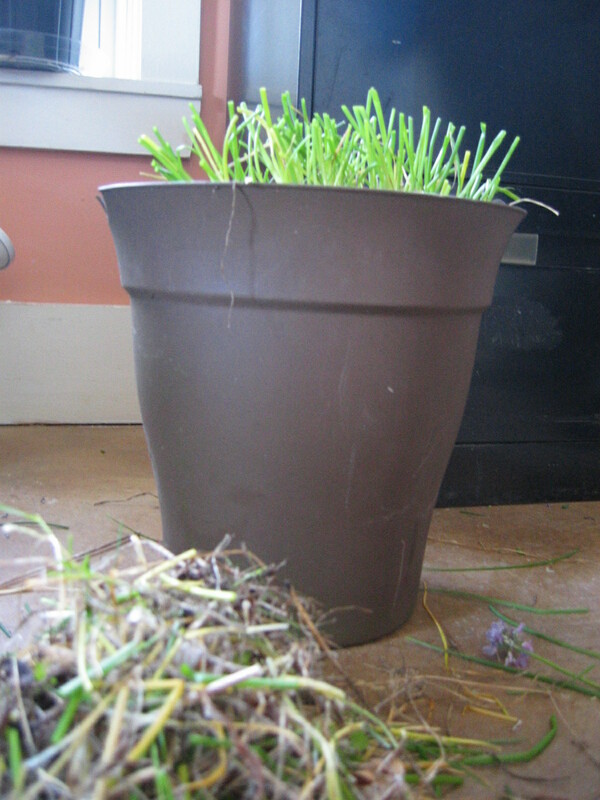 Then pop the outdoor part back into the ground and take the indoor clump with you to pot up. When you are potting up your herb make sure you choose a pot that gives room for the root ball to grow and use a potting soil that is nutrient rich with good drainage. Cut back any dead or unhealthy parts of the plants, and water well. You will need to acclimate plants gradually. Once your herbs are in pots place them in a shady spot outside for a couple of weeks. This allows them to grow the leaves they will need to survive inside. Plants produce two kinds of leaves in response to strong or weak light. High-light leaves are thick, strong, and narrow. Low-light leaves are thinner, more delicate, and broader than high-light leaves. But narrow high-light leaves are less efficient in converting light energy into food than low-light leaves. High-light leaves are accustomed to an abundance of light, so they don’t have to be as efficient at food production. A plant that is adapted to abundant light often turns brown and drops leaves indoors. This is because it can’t produce enough food to maintain itself. The plant tries to make food by shedding the inefficient leaves and producing efficient leaves higher up and closer to the light source. 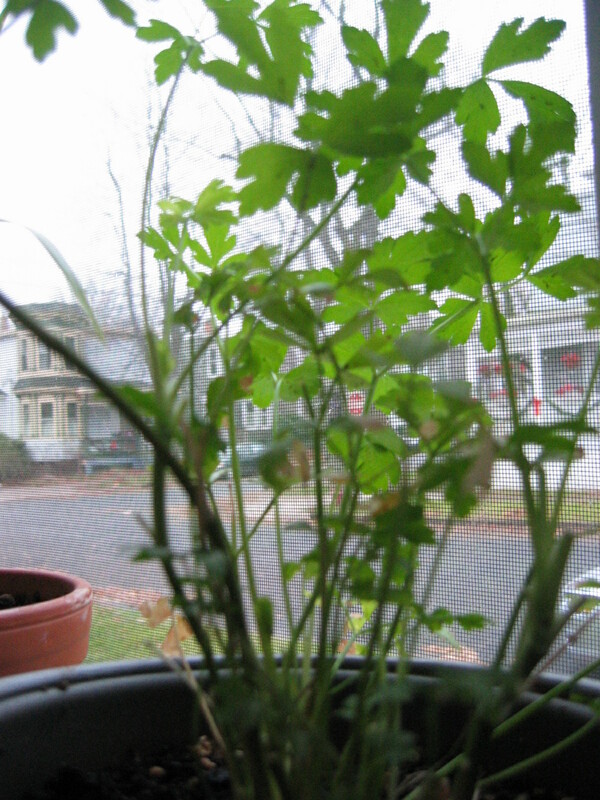 When you bring herbs indoors, this leaf drop and increased leggy growth can happen within weeks, or even days. Some herbs cannot make the transition fast enough to survive. Rosemary is a case in point. This slow-growing evergreen doesn’t have the chance to adjust to changes in light before the plant slowly starves itself. By January, February, or March, the leaves dry up, and the plant dies. This sudden death is by far the most common complaint about growing rosemary indoors. Here’s what to do: Gradually adjust the plant to lower light. Place it in partial shade for two to three weeks, then in deeper shade for another two to three weeks before bringing it indoors. 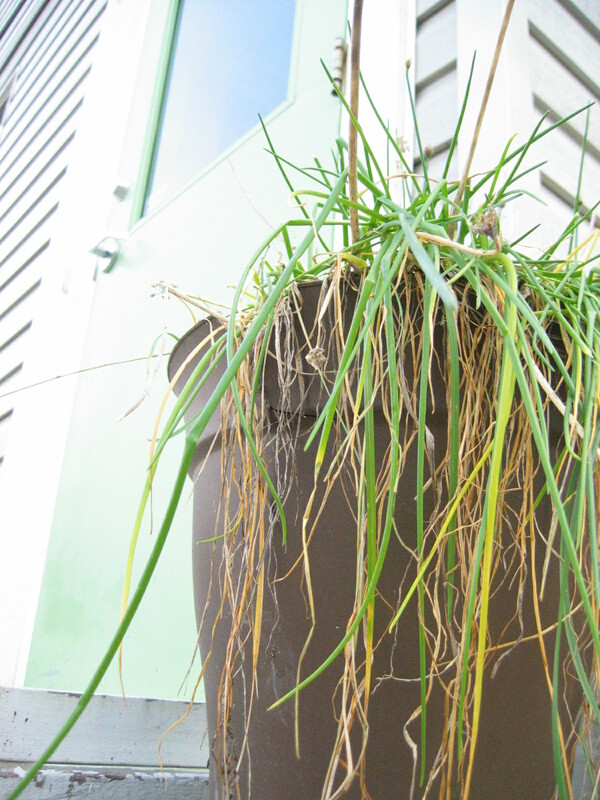 When plenty of new growth appears, the plant is ready to go into the house. As these herbs don’t mind the cold, they will be happiest living in a sunny cool spot in your house around 18 degrees celsius, with a slight drop in temprature at night. Take a look at our previous post Bring The Herbs Inside for an outline of how to care for your herbs once you have them inside, including light needs and fertilization.